Why do business with us? 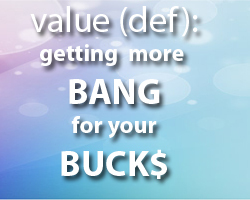 Simply put, our strategy is to price moderately and deliver more bang-for-the-buck than our competitors. We really want your business and we are willing to work to get it and work to keep it. We aren't trying to impress you by being the cheapest guy on the block. It is not good business sense for the client to expect us to be the lowest price and also do the best work - hardly fair. And just like you want integrity and fairness from your vendor, we want it from you too. So that is our value proposition... if you are willing to pay a moderately fair price, then we are going to roll up our sleeves and make sure the job is done right and your expectations are well exceeded. You have short-term and long-term objectives for your organization. These objectives are driving your current projects. Your plans have to stay on track. This takes priorities and a process that constantly evaluates their effectiveness and makes critical adjustments. We do this by focusing on what gets results for you - prioritize by productivity. Through a comprehensive Discovery Process, we define your mission and develop a plan for your project - then we stick to the plan. We want to keep all the project resources focused on producing results. We stay flexible. Every project we have ever done has produced new ideas or new information from our client that was not available in the discovery process. So we expect it, and if the new idea or information has a high priority then we find a way to make it work to our mutual benefit. This is collaboration and teamwork. We want to be part of your team. Your success and our success is built on it. The web site accomplishes its purpose for the organization. You have a site with good underlying architecture allowing for extensible growth for several years. You can make global changes to the site easily in minutes without making changes to all of the individual pages on the site. You can completely redesign your graphical user interface in the current platform with ease and do so with minimal disruption to the content. Graphic redesigns are then less expensive to implement. The code that your eyes dont see in the browser is clean so it is compatible across all major operating system and browser combinations. The less junk in the code, the less bunk on the screen. XI Interactive designs and develops web sites on an object-oriented application framework that keeps costs in control for years. Our development methods and code standards ensure that your web site will be able to evolve with your organization and the market you are in. If you have your organization's future in mind as well as its present, then it would benefit you to contact us and let us show you what we can do for you. How much will it cost to design and develop this version of the site? How long does this design version need to last? What information on my web site needs to be updated on an on-going basis? What are the infrastructure costs such as hosting platform hardware, software, or service costs? How will the architecture and infrastructure of the site effect the maintenance/updating of the site content during the life of this design? How will the architecture and infrastructure of the site effect upgrades and enhancements needed to grow the site for the next few years? How will the architecture of the site effect the costs of conversing this platform to the platform for next redesign?